We have had a lot of requests to hang artwork, and we certainly have plenty thereof stored away. Quite regularly these requests come from people who just happen to know a great artist (i.e. friend, neighbor, or themselves) whose work would make our place look spectacular. But the decor and ambiance of Gunk Haus is subject to the same scrutiny and thought that we put into our food. Art has to work with the look and feel, and not just fill an empty wall space. 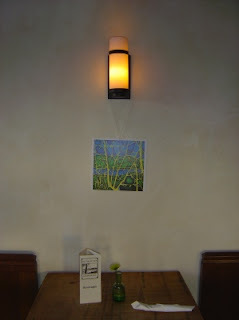 Being on a shoestring budget, compared to art museums anyway, we opted to bring great art to Gunk Haus for little money. Enter stage, left, our dear neighbor and artist extraordinaire Ann Haaland, who recently licensed some of her art for a calendar (available at Zazzle.com). I am particularly in love with her tree paintings. If I could afford them, she would be a rich woman, but for now her calendar has to suffice. So we got the calendar in the mail this week and hung the paintings throughout the beer hall, to get a feeling for how it would look like. The artwork still needs to be framed, but we are very happy with the look already.